This is why we have come. Today, we begin to forever change the lives of our patients, as well as those of their family and community. We will see 13 patients, a good number for the first day. 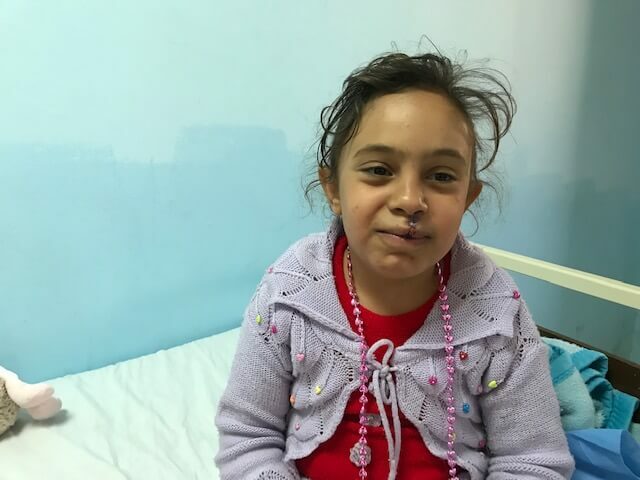 There are cleft lips to repair, a revision of a previous cleft, fistulas to close, and burn contractures to release. Pictured above are Paulette McHugh, Operating Room Nurse, Roop Gill, Plastic Surgeon, and Arafa Elhawary, Operating Room Manager. 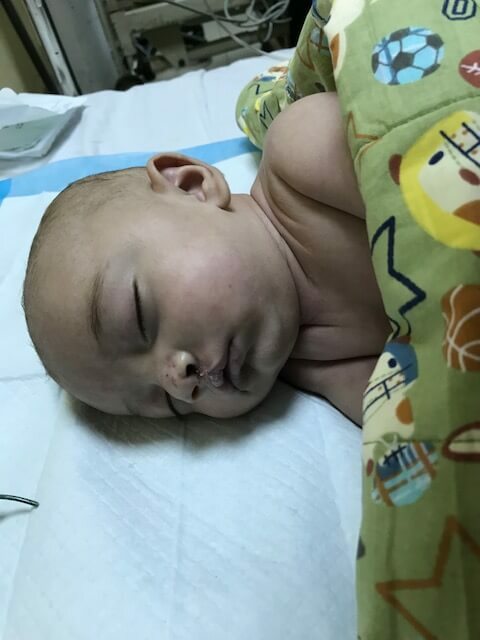 Fares before surgery for a bilateral cleft lip. 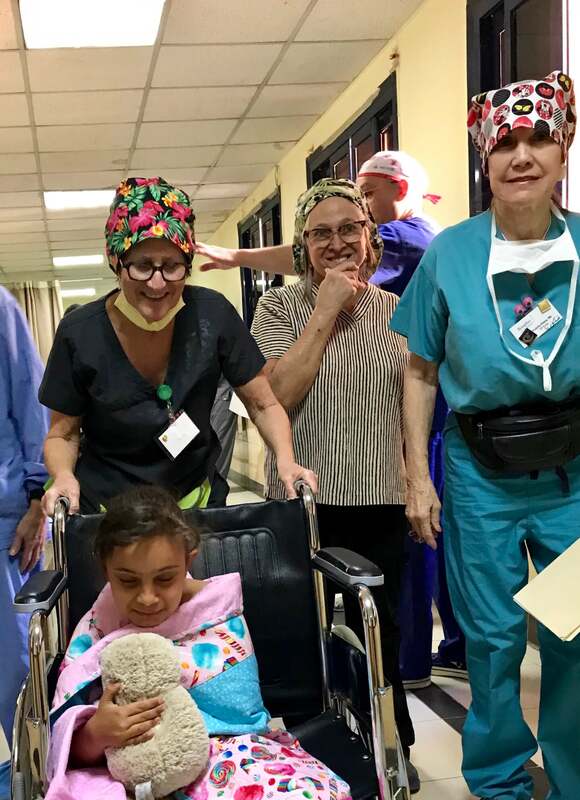 Ehab headed into the operating room with Operating Room Nurse, Paulette McHugh, Head Nurse, Kim Capps, and Operating Room Nurse, Victoria Slama. 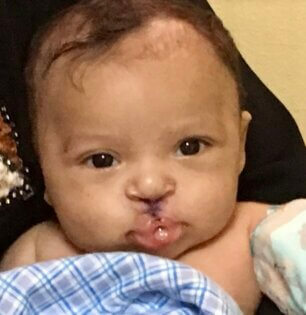 Ehab after her cleft lip has been repaired. 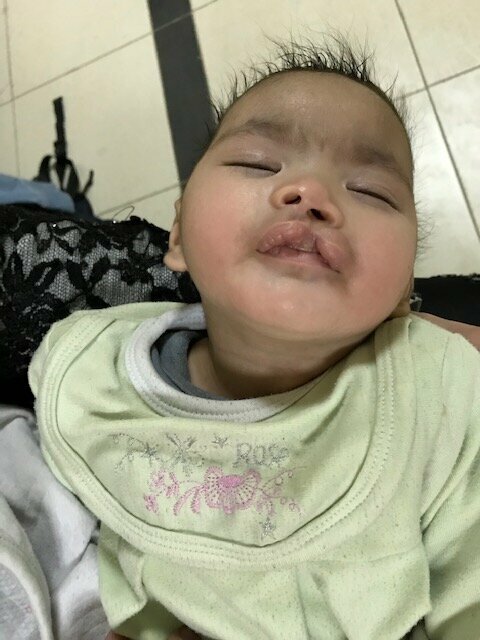 The swelling will go down and soon it will be as if she never had a cleft. This little boy had a burn injury. The skin around his armpit contracted, and he was unable to move his arm. We were able to release this with surgery. 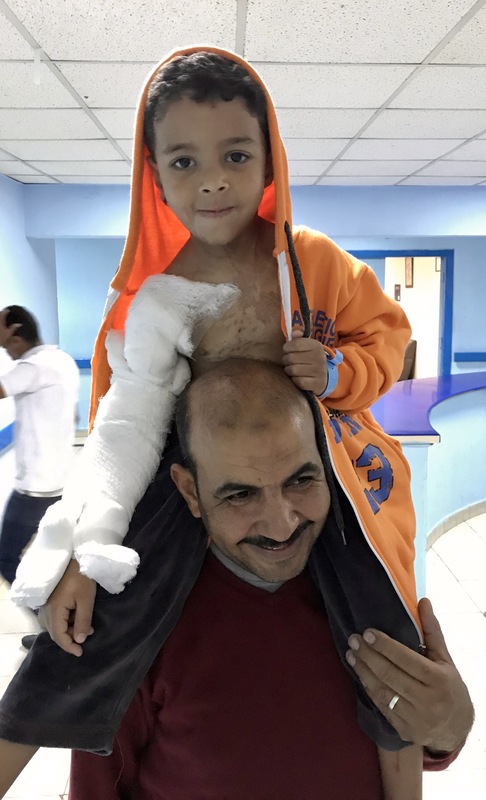 His ever attentive dad carried him around the ward, so his arm could be supported. 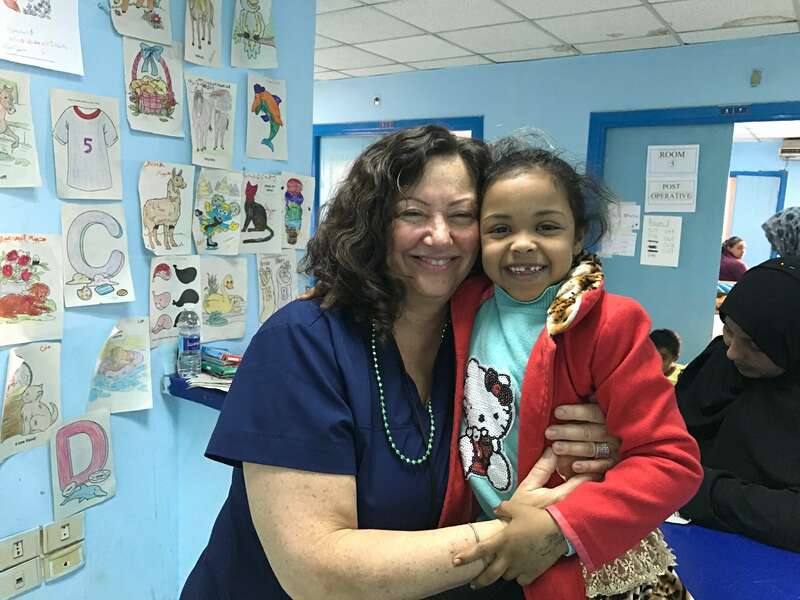 Barbie Hernandez, our recreational therapist, is doing activities with the children. They are working on a “Wall of Fame” with artwork by patients, families and volunteers. 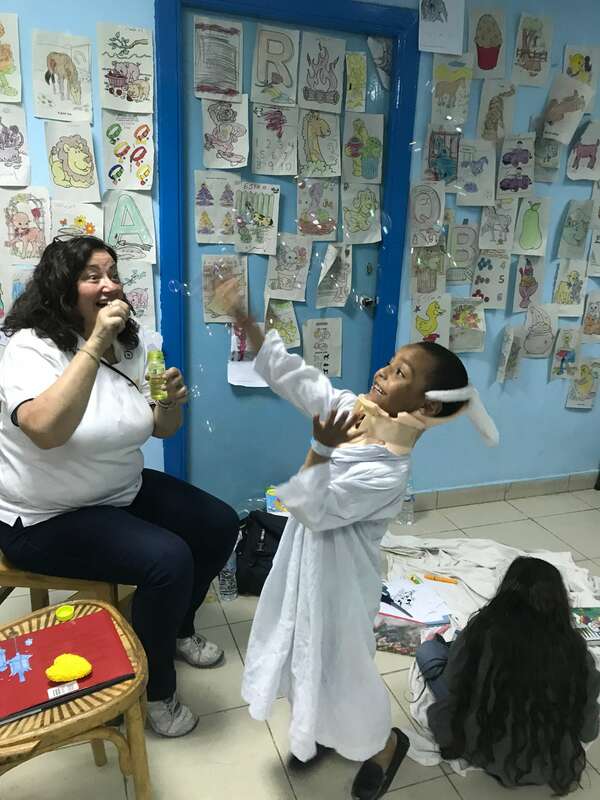 With the help of AFS’ers and parents, they have blown and popped bubbles, played clapping games, done puzzles, sang great songs like “The Wheels on the Bus”, “Row, Row, Row Your Boat”, and “Ittsy Bittsy Spider”. Susie Fox is our Ward Coordinator. She’s in charge of getting our patients checked in, and getting them settled in their rooms. She tracks all the patients and charts for rounds, and for patients headed to surgery. 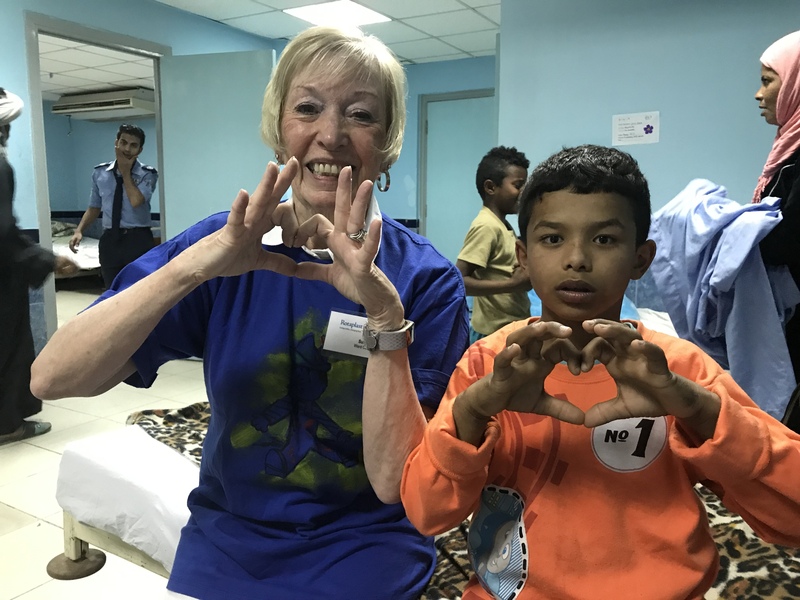 Susie also finds time to play with the patients. 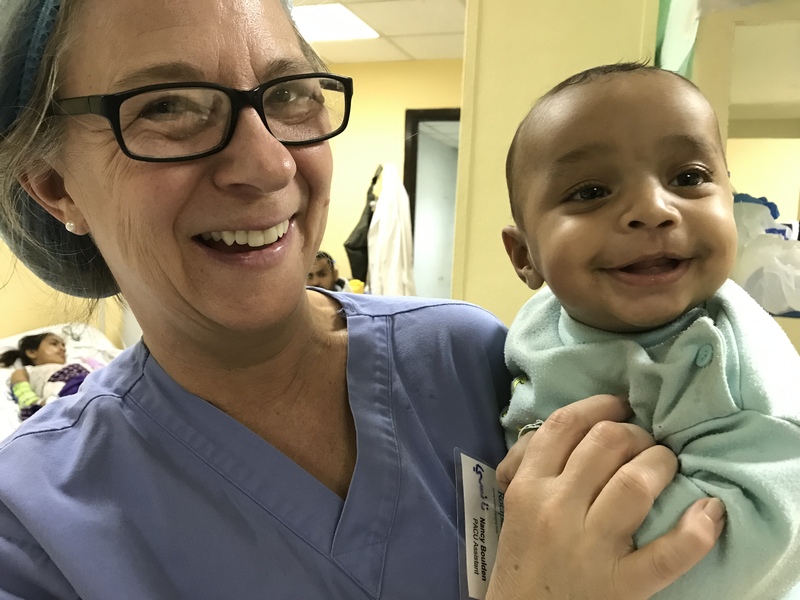 Karen Davis, our Pediatric Nurse Practitioner, is stationed up on the ward taking care of our patients pre and post-op, which keeps her very busy. Even still, she takes her time thoroughly explaining things to families and throughly answering their many questions, caring for them as if they were her own children and family. Here, a potential patient is listening to Karen’s heart. 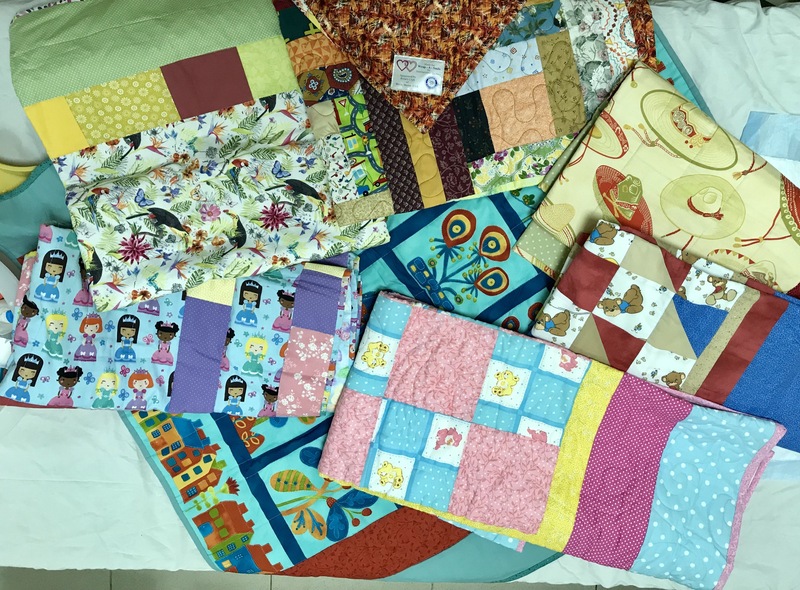 Each patient receives a beautiful, handmade quilt thorough the Wrap a Smile program started by Terry Hodskins of the Wells, Maine Rotary Club, USA. People from around the world now make quilts for our patients, spending many hours on each one. On this trip, labels have been from as far away as British Columbia, Canada, and Minnesota, USA. 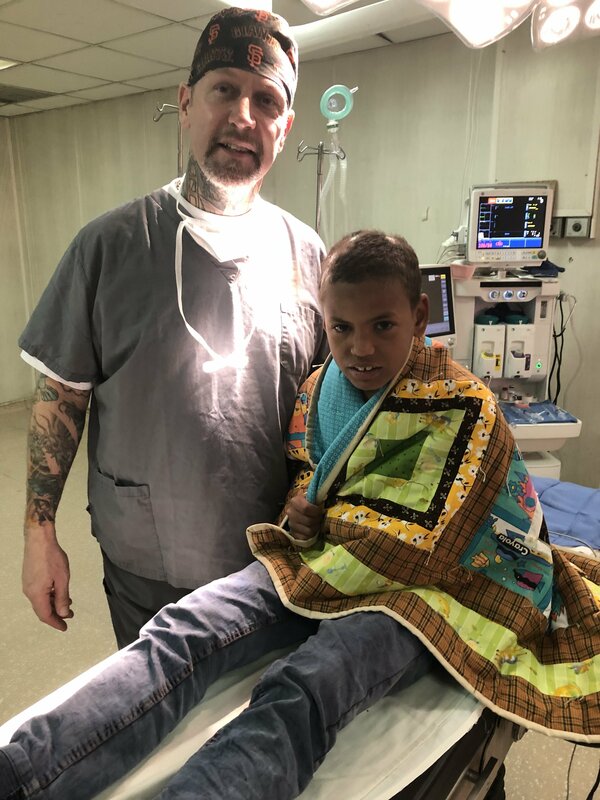 David Sparks, Operating Room Nurse with a patient ready for surgery with a quilt made by the women of Colonial Church in Prairie Village, Kansas, USA. 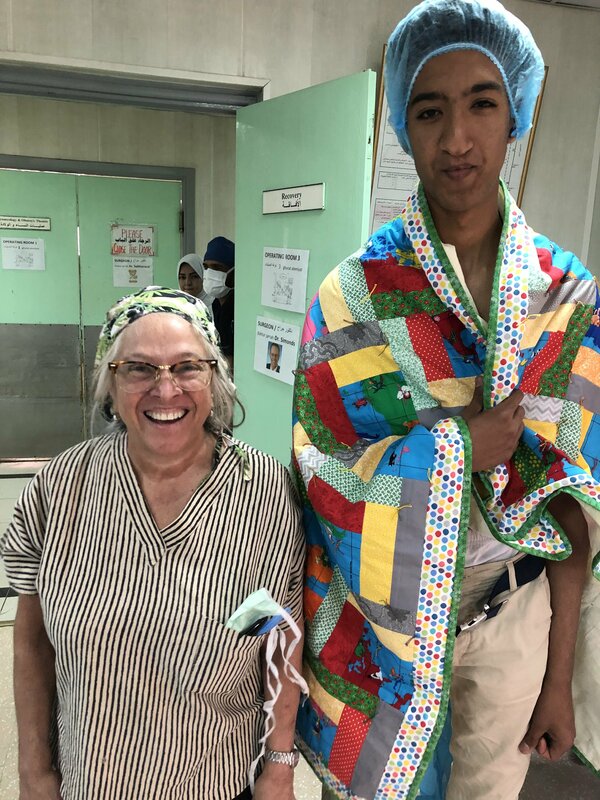 Kim Capps, Head Nurse and a patient coming into the operating room with another quilt from Colonial Church, sent to us via our Lead Anesthesiologist, Neal Fleming’s mom. 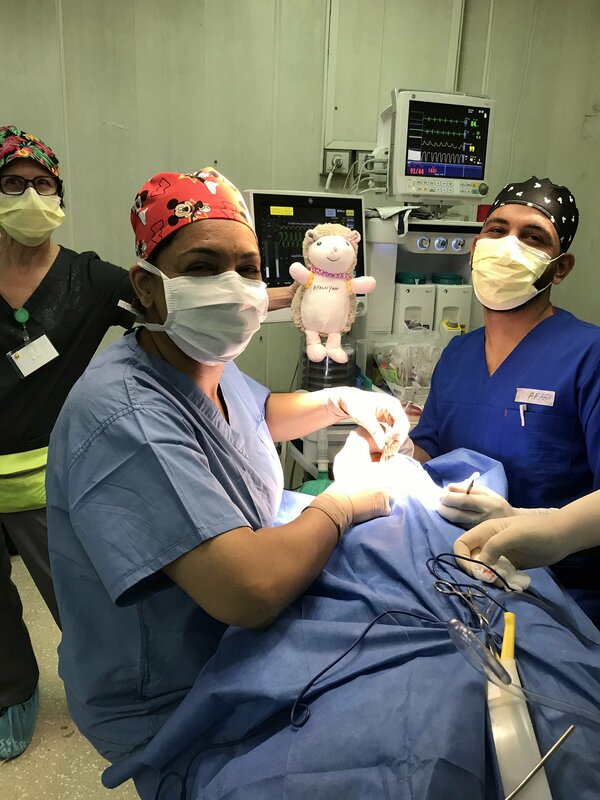 Each patient also receives a stuffed animal in the operating room. 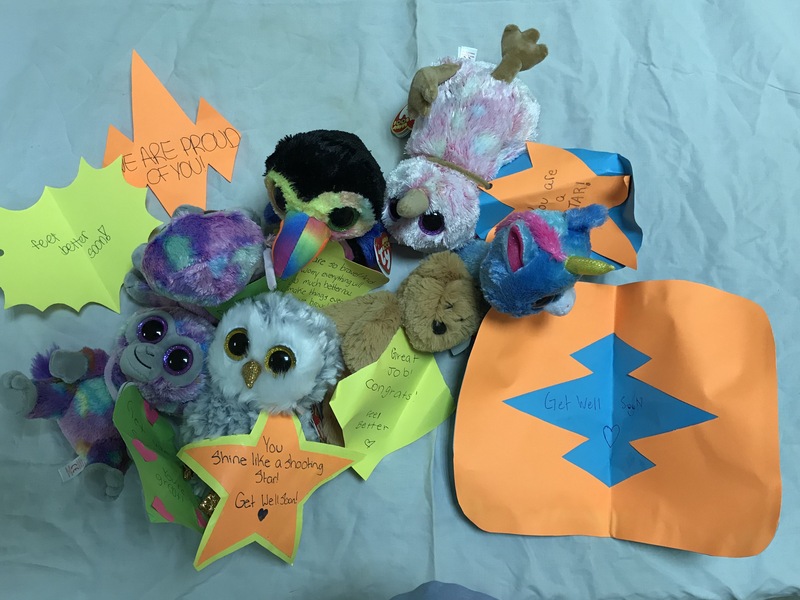 These particular animals were presented to us by the Novato High School Interact Club (High School Rotary), sponsored by the Rotary Club of Ignacio in California, USA, District 5150, and were brought to us by Barbie Hernandez, our Recreational Therapist. Nancy Boulden, PACU Assistant, helps to make our recovery room run smoothly. 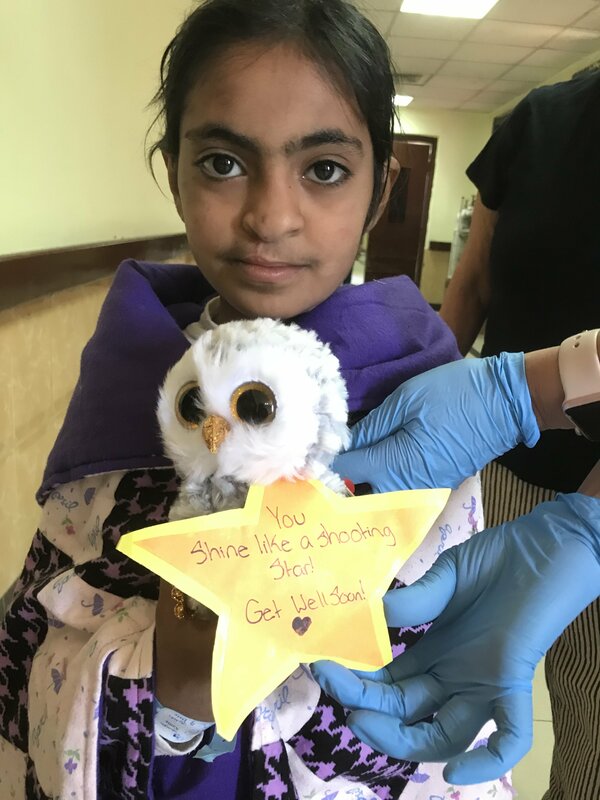 She assists with patients going into the operating room, watches over patients after surgery, and supports our two PACU nurses with whatever is needed. 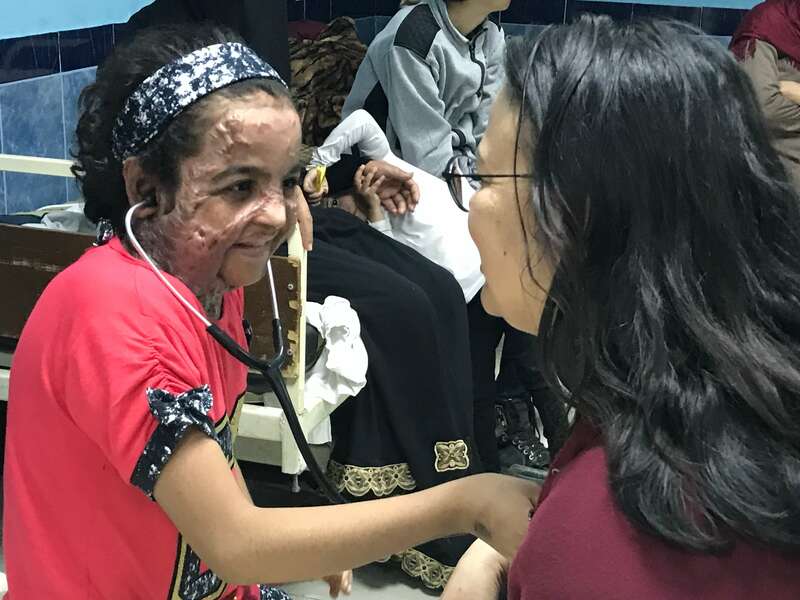 Here, she is enjoying the company of a happy, prospective patient.